If simple, responsive and nicely coded is what you’re looking for in a WordPress theme, you’ll find it here. Free WordPress themes are the way to go if you don’t rely on heavy design customization and your content is more important than the looks. Let us take a closer look at some of the best Best Free Premium WordPress themes. Released just a couple of weeks ago by yours truly, it was our intention to emphasize the importance of using best practices in creating a WordPress theme. Tell us what you think. We’re constantly trying to improve its functionality and usability. 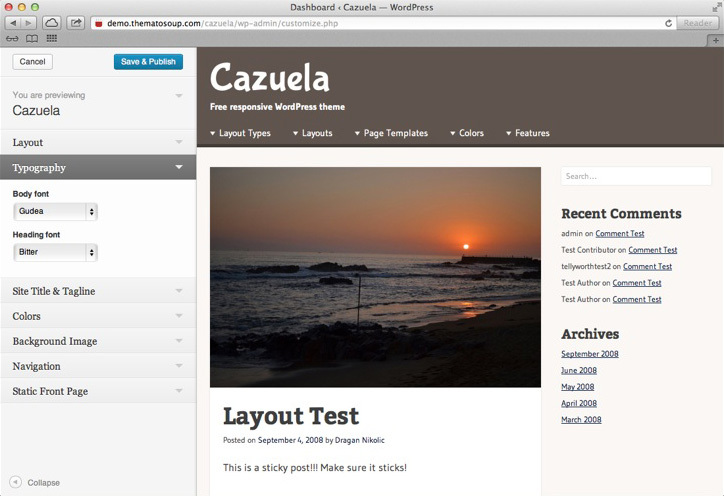 If you’re not convinced you should give it a try, head over to our blog and read an article which explains Cazuela theme in detail. Just look at those colors in Twenty Thirteen theme. Last year’s default theme was bland and meant to let your content do the talking, this one jumps at you with a vibrant color scheme and matching header images, but makes sure your content looks great, too. This theme doesn’t have “options page” as you can perform all the changes using a built in customizer, if you have WordPress 3.6 installed. 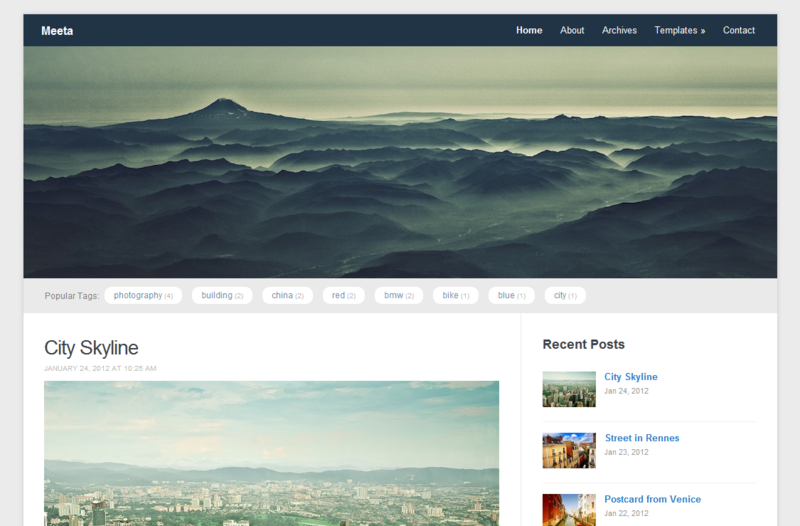 If you like how it looks, go ahead and read how it performs in our full review of the Twenty Thirteen theme. We havent’s had an ecommerce WordPress theme featured, up until now. This one comes from a distinguished theme shop called WooThemes and it’s going to get you ready for running your own ecommerce website. It’s clean and lightweight and responsive, but has a lot of other options and different color schemes. The name says it all. It’s responsive and features slick design. You’ll find a gap of a couple of hundred pixels where this theme doesn’t respond so well to a narrowed browser window, but for mobile devices and most of the screen sizes out there it’ll work just great. Minimalist WordPress theme will certainly give a unique look to your website. 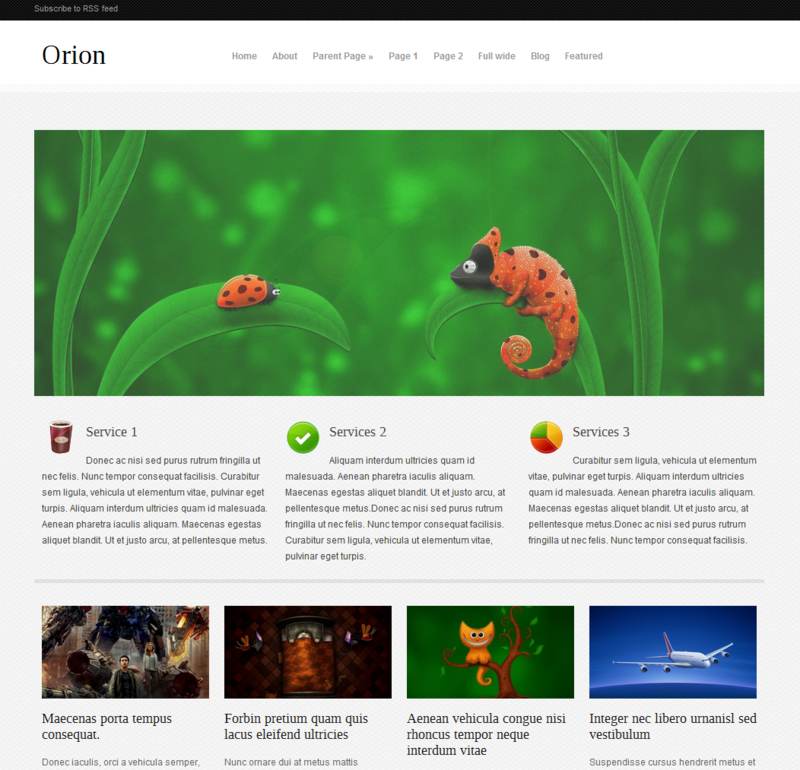 Orion Portfolio WordPress template is fully responsive and it will automatically adjust the theme layout according to screen size of the device you’re browsing on, ensuring the best user experience. This premium WordPress theme is great for any designer portfolio or business website. It features nice typography and clean design with a jQuery slider for featured posts. Orion also has its own options page. Meeta is a nice and simple blogging WordPress theme. Again, fully responsive, you’ll have no problems browsing on any screen size gadget and with some premium features like unique widgets and custom templates. You can change a bunch of stuff using the advanced WPZOOM options panel. 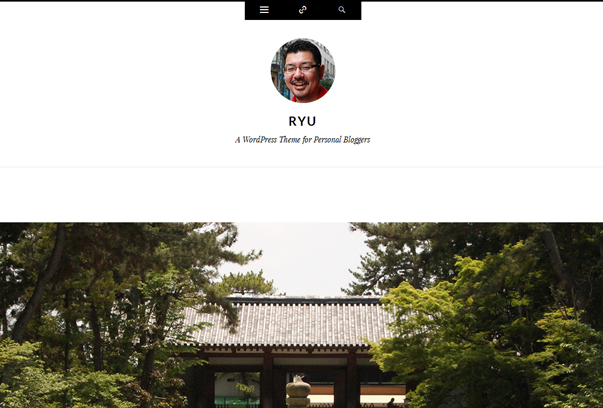 A simple responsive theme for your personal, elegant-looking blog. Origin can be used as is or as a platform for heavy customization via child themes. It features responsive layout, clean code, breadcrubs and is translation ready (translation to French included). 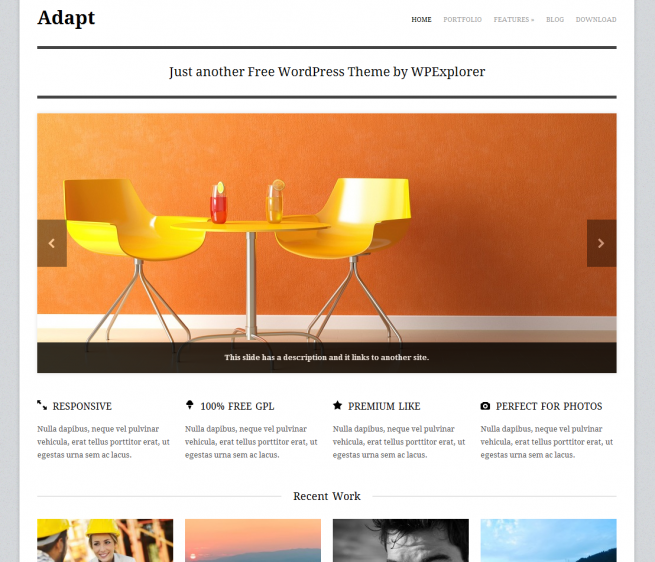 Adapt is a fully responsive free business or portfolio WordPres theme. It features a clean and elegant design. It has built-in post types for your portfolio, homepage highlights and homepage slider so your content doesn’t suffer. 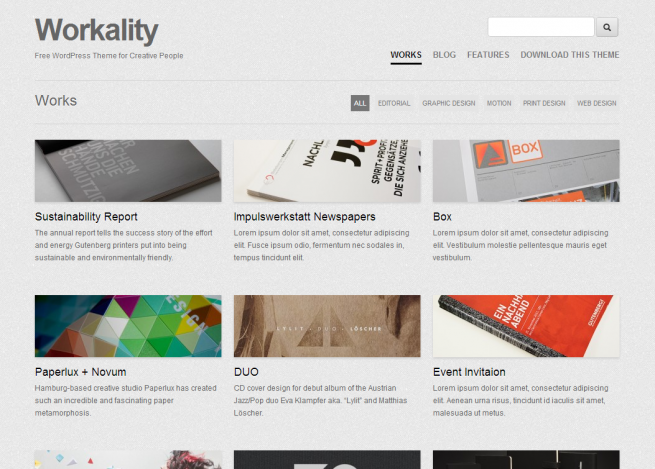 Workality is a nice portfolio WordPress template that has many premium features, rarely seen in a free theme. Custom Post Types, 4 Portfolio Layouts with 4 different thumbnail sizes, ready to be translated into the language of your choice and is fully responsive. Images, videos, and text will scale down gracefully to iPad, iPhone and all mobile devices. 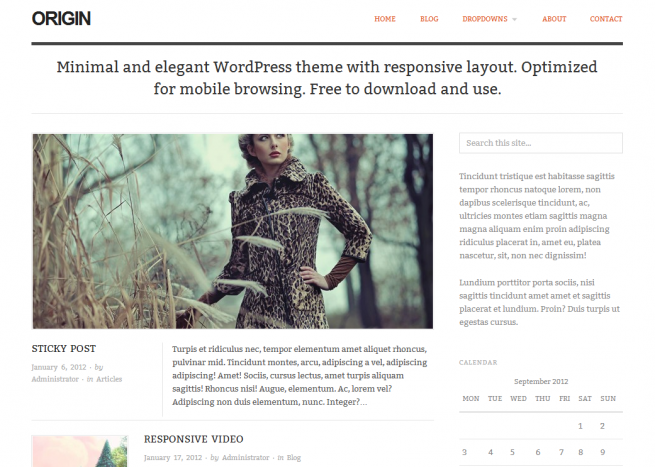 Oxygen is a professional magazine theme with responsive layout. 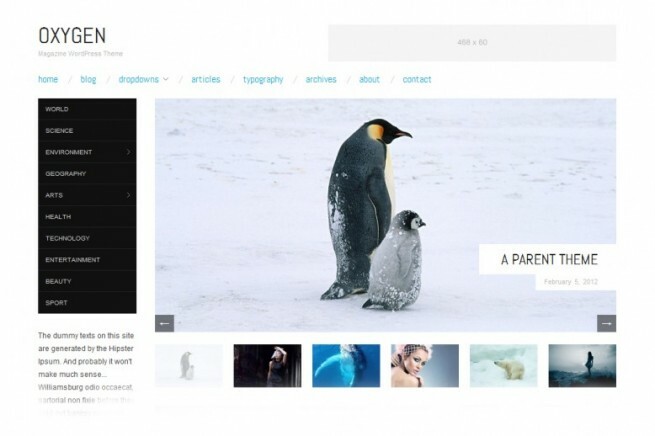 It’s also a great base for creating child themes, built on the well-recognized Hybrid Core framework. Theme features content slider, custom front page template, 3 menus and 5 flexible widget areas, CSS for contact form plugins – Gravity Forms and Contact Form 7 and is translation ready. Workz is a free WordPress theme by WPExplorer. 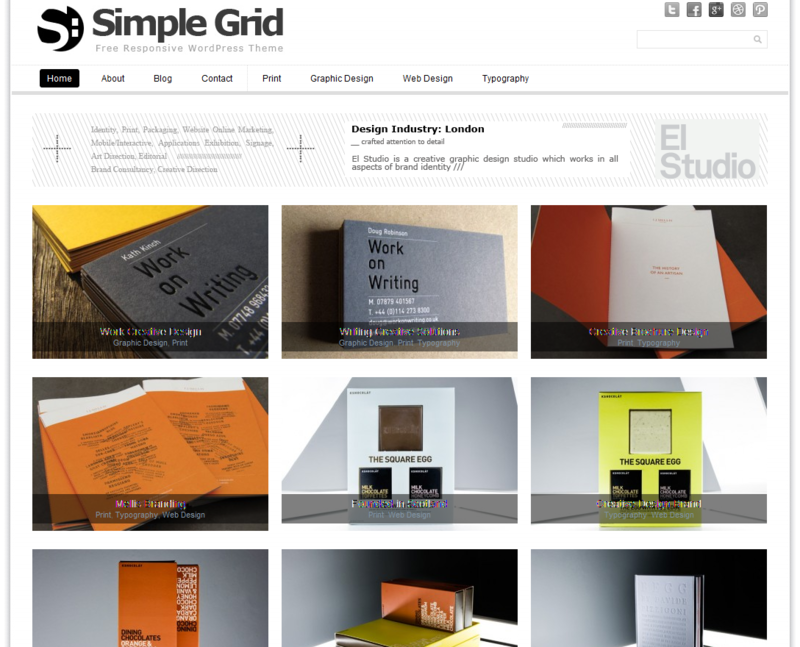 It’s perfect for business or portfolio websites. It has some neat functions built-in, not typically found in free WordPress themes and a very clean and minimal design. Keep in mind that you have to register to download this theme (registration is free and fast). A theme based on the Underscores (_s) and TwentyTwelve themes, which means it’s very solid, flexible and easy to customize. The developer claims the code to be “clean and tidy and sprinkled with just the right amount of comments to help make editing a real breeze”. 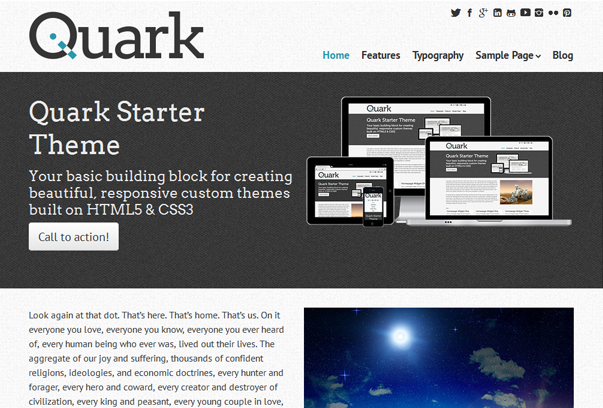 Quark has a lot of features, most of which you’ll find in the dedicated Theme Options panel, which is unfortunate, since Theme Customizer is the way to go, but the theme does follow most of WordPress best practices, so you’ll find zero problems running it. 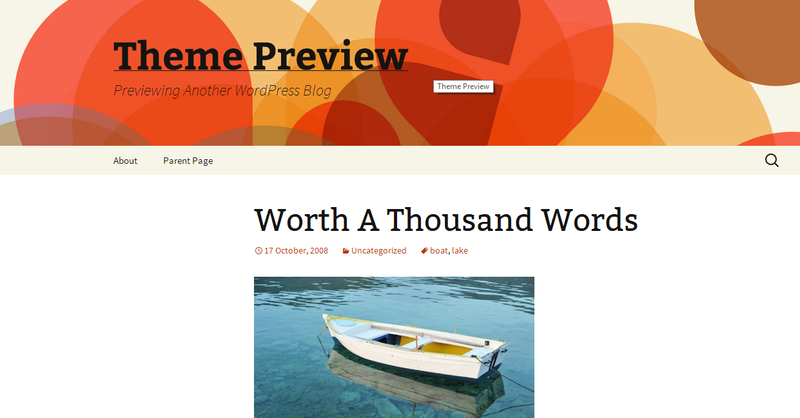 It’s a clutter-free theme for personal bloggers by Automattic, guys who develop WordPress. Legibility on this theme is great with a large font size and the one-column layout, which is awesome for showing large images. The interesting thing about it is that widgets are located at the top panel with social media links and a search field. Another cool feature is that background color for an image post will try to automatically match the uploaded image in the post. It’s true that free premium themes may not offer the functionality, support or options you get in paid ones, but sometimes you can complement those features with various plugins and a little bit of customization with the help of a developer friend. If there’s a Free WordPress Theme you use or think it deserves to be featured, please share it with me. I just love free stuff. Yes, responsive themes are so important today. The Orion theme has a little bit strange licence to me. But the choice of themes is 1. Responsive WordPress themes are becoming mainstream and for a good reason. Nobody can know which device (screen size) people are going to use for browsing a website. Glad you like the choice of themes. Great themes. I’ve recently fell out of love with WordPress due to the lack of clean simple themes. I’ll give these a test run. As long as you have any kind of feeling toward WordPress, there’s still a chance you’ll find the one. If you stumble upon other clean and simple themes, do let me know. I’m in pursuit myself. Very happy with all these themes some times it takes a while to get the right theme and these post are really us full when it’s come to theme research, Thanks for the great post. Glad you found the post useful, Raquel.